Nevertheless of the huge demands and needs of our patrons in this nation, we have been able to present an efficient collection of Steel Railing. Keeping in view the importance of significantly growing rail sector in India and the nearby markets, JSPL has pioneered manufacturing of 121 meter long track rails and a facility to factory weld these rails in welded lengths of up to 480 meter. The world's longest track rails are a testimony to JSPL's manufacturing capabilities where continuous innovation is a practice rather than an exception. 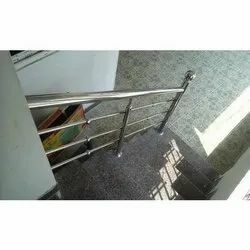 With the support of our skilled professionals, we are able to provide a remarkable range of Steel Railing, which is available in varied patterns and colors. The offered range of railing is widely acclaimed for rust resistance and easy maintenance. 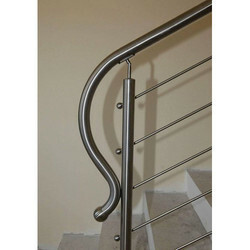 We are manufacturer of steel railing at Home, Malls, Showrooms with Cheaper rate with good quality.